Tiffany Haggerty is an accounting associate with a passion for children and watching them grow. After the recent birth of her daughter, Reagan, she felt the push toward writing geared toward young minds. With the support of her husband, Kyle, she was encouraged to put her thoughts into print. 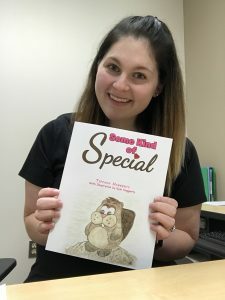 With the use of her psychology degree as a basis and her love for children, the encouraging words flow through her work and she is able to provide an important lesson of self-worth. My daughter and hoping to help our children grow to have confidence in themselves. I tend to come up with a jumble of thoughta, write them all down and then work to coordinate them into a more condensed idea or story. I can’t say that I have, but my story as an author is just beginning so who knows! Trust your gut and write what you know and love! Because this was a hobby interest, I chose a publisher to help me. If you’re new to the business, like me, I’d suggest a publisher who is widely known to help with marketing. Book number two is currently in the works!